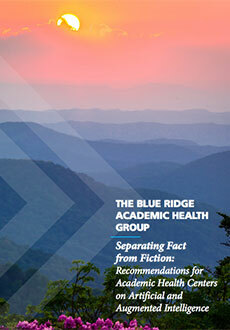 The Blue Ridge Academic Health Group (BRAHG) has released its Winter 2019 report: Separating Fact from Fiction: Recommendations for Academic Health Centers on Artificial and Augmented Intelligence. Today's health care professionals are bombarded with data from multiple sources—diagnostic, claims, financial, psychosocial, epidemiologic, biometric, genomic and consumer-generated. With health care data expected to double every 73 days through 2020, the sheer quantity of such data necessitates a fundamental shift in how it is curated and interpreted. Artificial intelligence (AI) is the subject of tremendous discussion in health care as a developing set of technologies with the potential to transform patient care and business processes. AI has enormous potential to help clinicians, researchers, learners and patients alike. This report explores the potential impact of AI on health and health care, identifies challenges and emerging risks associ­ated with AI-based technologies, considers unanswered questions across all mission elements, and describes how academic health systems can harness these new capabilities. Read more. The BRAHG report was prepared by some of the most influential leaders in academic medicine. BRAHG co-chairs are Jonathan S. Lewin, MD, executive vice president for health affairs, Emory University; executive director, Woodruff Health Sciences Center; and president, CEO, and chairman of the Board, Emory Healthcare; and Jeffrey R. Balser, MD, president and CEO, Vanderbilt University Medical Center; and dean, Vanderbilt University School of Medicine. Blue Ridge Academic Health Group comprises 15-20 members who are primarily leaders of academic health centers and are experts in health policy and practice. The group studies and reports on issues of fundamental importance to improving the U.S. health care system and enhancing the ability of academic health centers to sustain optimal progress in health and health care through sound research and health professional education.